Lizzie's Arty Crafty 'n Dolls: Dolls! 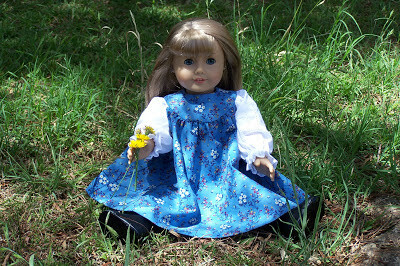 Prairie Dress for an American Girl Doll, All Finished. Dolls! Prairie Dress for an American Girl Doll, All Finished. 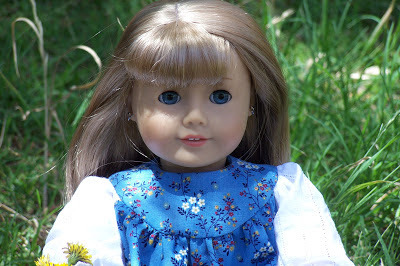 This is the dress that I made for my American Girl doll using McCalls 6327. I am going to make the bonnet and matching bloomers, but I have to make the pencil case for my niece's christmas present first. Especially as it is Christmas in a week's time! I am not sure if I will put the lace trims on the dress as they did in the pattern. As I went to some effort to get the white flowers in the centre of the neckline, I think that lace would be too busy. I might just put it around the hem. Oh, that turned out really nice. I agree, you don't need lace trim. The flowers are perfect. Thanks Audra, it is a great pattern. I hope the bonnet turns out as well.